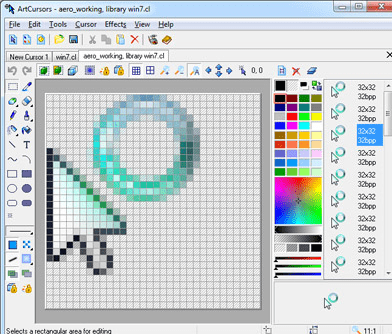 Create, edit or manage a cursor library with ArtCursors. This is an award winning software that can save a lot of time of any professional or casual graphics creator. The program is equally friendly for the casual user to just play around with standard .cur files, yet powerful enough for the professional graphic designer who needs to create complex animated cursors and manage large cursor libraries. With ArtCursors you can perform the following functions; create and edit cursors for Windows XP in 32-bit color depth with 8-bit alpha channel, import cursors from .cur, .ani, .ico, .wmf, .emf, .bmp, .wbmp, .jpg, .gif, .xbm, .xpm and .png files, open and edit small images, extract cursors from windows executables, libraries and animated cursor files and collect cursors from folders and subfolders into libraries. ArtCursors has many other features besides these. This software also is extremely easy to use and has an exhaustible user manual. ArtCursors is yet another wonderful tool for art creators. The paint features this has to offer areas vast as a pro paint program with many more. Better than expected! Definately worth its money in value! Awsome with animation with live preview and layers.